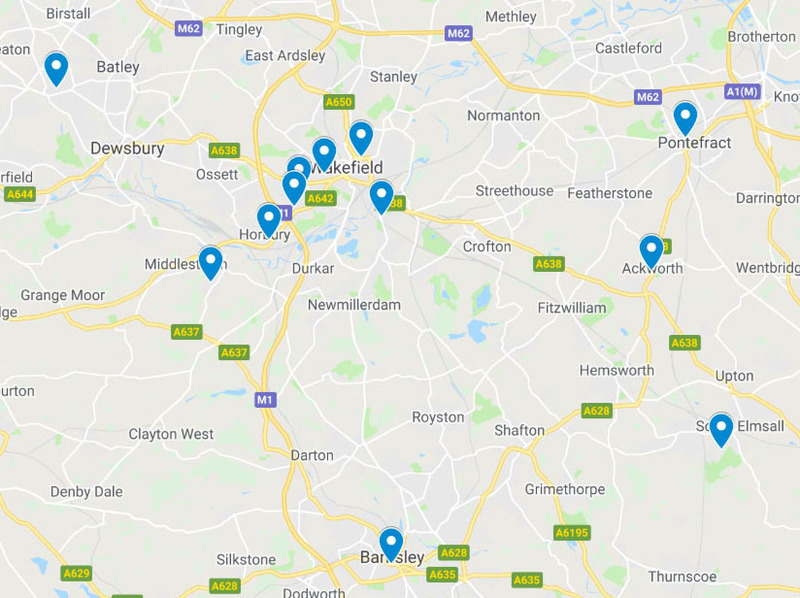 This section shows some of the clubs that you can go to in and around the Wakefield area, to hook up and play with other players of all abilities. Click on the blue links to view more information about each club. They are ordered by rough distance from the centre of Wakefield. Please contact us if any information is incorrect. Click here for an interactive map of all the locations where you can play. and on Wednesdays from 2pm-4pm. Although on both days people tend to be around from around 1.30pm. The cost is £3.00 per person, and there are 3 tables. Table Tennis is for anyone who wishes to come along, £1.50 a session and is held at Jubilee Hall in the main hall every Monday and Thursday 10am til 12pm. Over 55's at Jubilee Hall every Tuesday 1pm till 3pm, just £1.50 a session, come along and chatter, play cards /dominos, table tennis or enjoy the company. Table tennis is open for anyone, on Friday evenings, from 7.30pm to 9.00pm. The cost is £1, this is towards the heating and lighting. Keith Hurley runs the evening, please ask for him and he will make you welcome. There are 3 tables available. Go to the church building and find the hall. You will typically play a single games to 21 points, then swap around with the next available player, but also doubles if there are lots of players. 7pm-8.30pm, anybody welcome who is 16 or over. This is a small and friendly group that meet weekly on Monday evenings 7pm-8.30pm, run by volunteers. It’s a great way to meet new people and enjoy a little exercise too. The session is £1. Table tennis is on here on Mondays 10am to 12pm and Fridays 1pm-3pm. 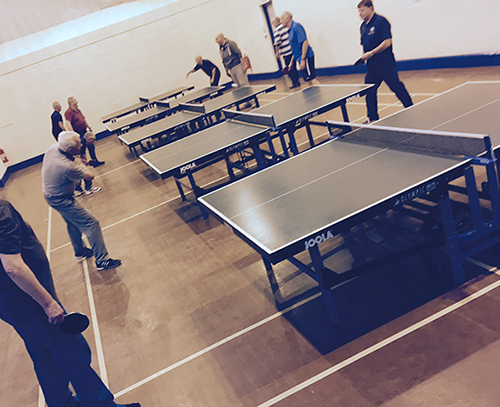 The table tennis club at Netherton meets in the village hall every Monday from 6.30pm to 8.30pm (though someone is normally there a few minutes earlier). There are up to 5 tables in total, and players of all ages and abilities are welcome. Typically players range from teenagers up to pensioners and everything in between! You will play singles games against whoever is available next, and play 2 games up to 21 points, then move on to the next person available. It's a great place to meet players of varying ability (from league players to beginners) and get some fun and friendly practice in. Ackworth School is a Table Tennis England Centre of Excellence. Contact Chris Parker below to check the session is on if it is your first time. Poster/PDF: View the poster/pdf show the sessions and costs. The Dewsbury Table Tennis Centre, located at Cemetery Road, Heckmondwike is fast becoming the favourite for many Table Tennis players from both inside and outside the North Kirklees boundary. Players from Leeds, Wakefield, Bradford and Huddersfield are involved in competitive Table Tennis alongside Dewsbury players. You are welcome to go along and play from 8.30pm-10.30pm on Friday evenings. There are also Tuesday and Thursday daytime sessions, please see the schedule. More information can be found on their web site below. There is a table tennis club in Barnsley on Blucher Street. Its located on the first floor of Hope House Church. Barnsley League match nights are on Monday Nights 7pm til 10pm. Wakefield League match nights are on Thursday Nights 7pm till 10pm, but some table's available. Cost of full membership to Barnsley Table Tennis Club is £100 per year or Pay on the day £3 per session. The club meets every Tuesday from 5pm-7pm, all levels of player are welcome, adults and youth. The cost is £2.00 and there are 5 tables, with training available. They also occasionally play on a Thursday evening.